How Does Mangoapps Sync Work? 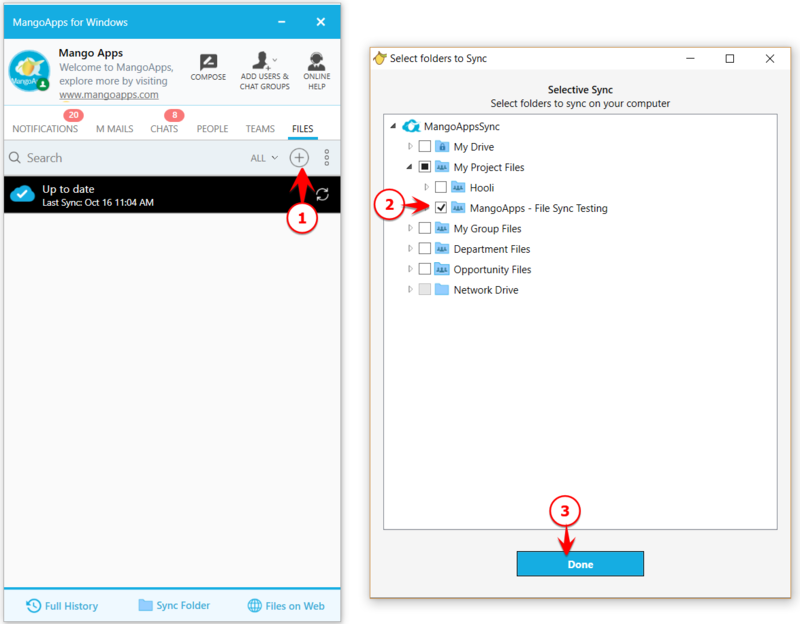 /Enterprise File Sync /How Does Mangoapps Sync Work? How do I configure MangoApps Sync? What are the default folders and files getting synced? How do I bulk sync multiple files at once? How can I move files and folders that I have synced? How do I add or remove a folder from sync? Can I pause and resume sync? Can I view a sync summary? How many computers can a user sync? How do I unlink a computer from MangoApps for Windows? Can I sync files that are attached from external repositories? What kind of files would not be synced from my local disk to MangoApps cloud? 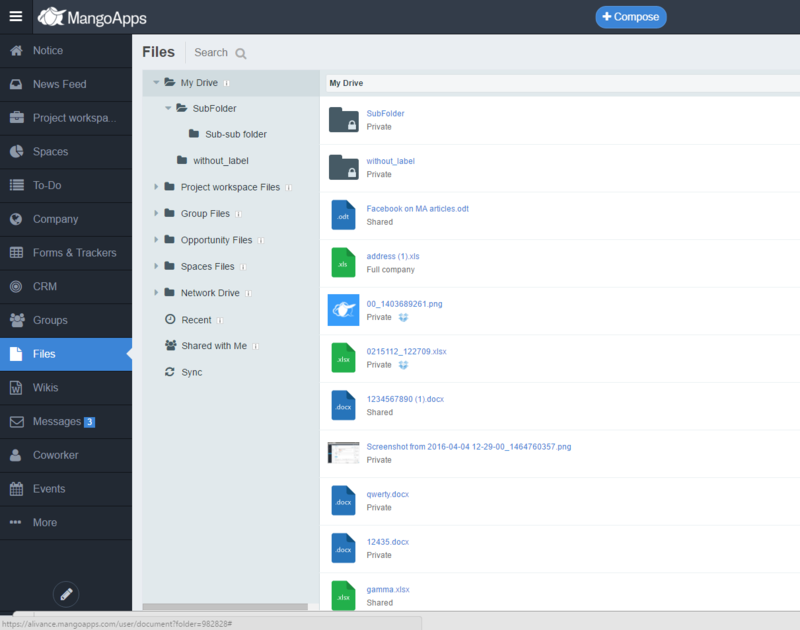 MangoApps Sync is a productivity tool that allows you to mirror data stored on MangoApps to your desktop. You can then navigate and modify content stored on the MangoApps domain through your computer’s native file browsing interface, without using a web browser. Content that syncs down to your computer is available for offline access. If you make changes to the synced files locally, these changes are automatically synced back up to your MangoApps account, providing universal access to your files via the web, your computer or your mobile devices — wherever you are. 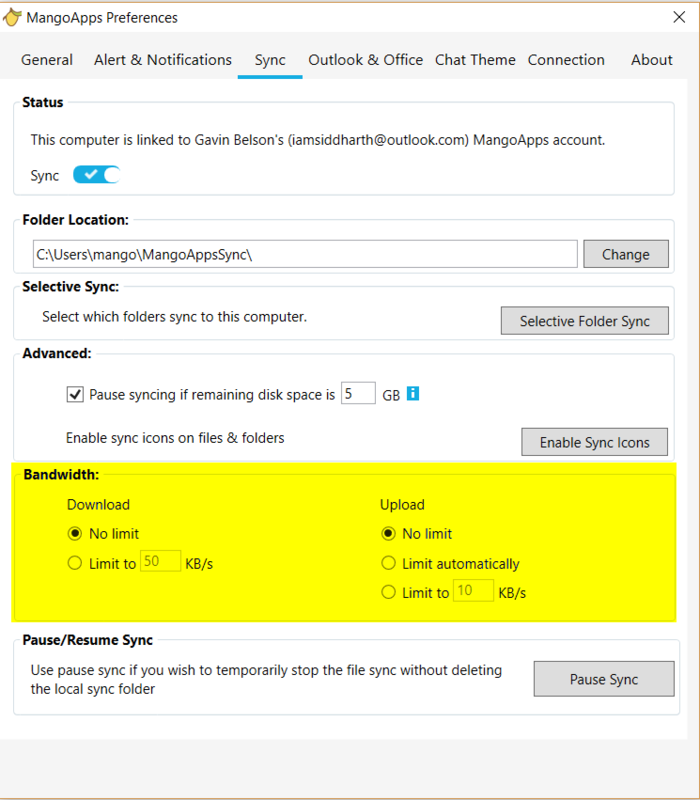 Click on the files tab on your MangoApps for Windows client, you will be presented with an option to configure sync. 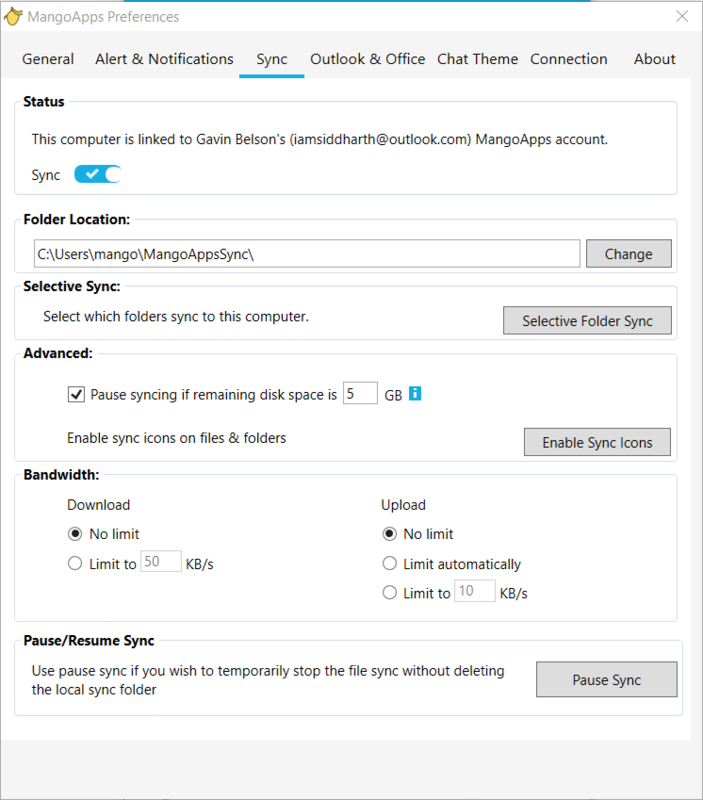 Clicking on “Start Sync” will automatically sync all your files from “My Drive“, you can alternatively setup a selective sync of your folders from your MangoApps account by clicking on “Selective Sync“. Clicking on customize folder settings will present you with the following screen. Click on add folders to choose the folders you wish to sync on your computer. Then, start syncing. What are the default folders & files getting synced? My Drive gets synced by default once you have enabled start syncing. This is your personal work folder. By default the files uploaded and folders created here are private and only accessible to you. 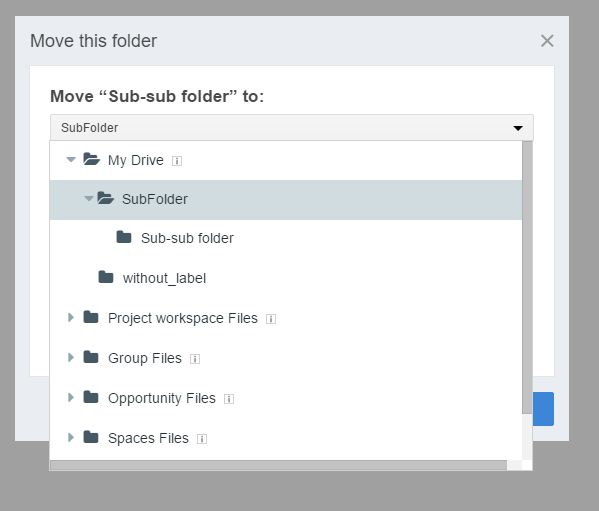 You can share and un-share these files & folders with co-workers & teams, when required with appropriate permissions. Bulk sync in MangoApps is easy. Just drag a group of files or even files with folder hierarchies into your “My Drive” and inside any directory that already exists. When the sync completes, the folder hierarchy and the files will be in MangoApps in your “My Work Folder”. Then choose the location in MangoApps where you want to move the folder. Download the top-level folder of the files or folders that you want to move all at once to your local computer. Remove by deleting or moving any of the files or folders on your local machine’s copy of the folder that you don’t want to move back to MangoApps. Rename the folder on your local machine. Bulk Upload the renamed file to the location that contains the original top-level folder in step #1. VERY DANGEROUS AND OPTIONAL Because when you delete things, their data is removed from MangoApps, you don’t need to delete the original folder for some time or ever, if you want to be safe. 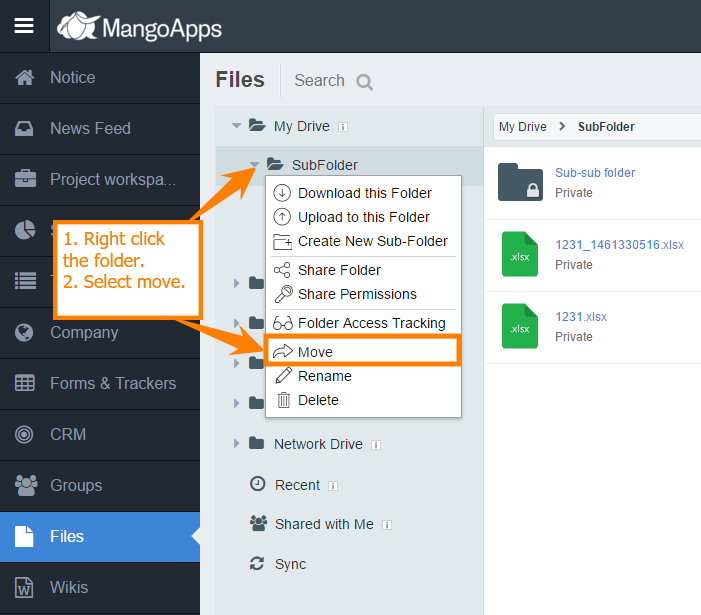 If you are wanting to clean up the folder structure and understand that deleting items removes them from MangoApps, you can right-click and choose “Delete” on the top-level folder chosen in #1. This is not recommended. How do I Add or Remove remove a folder from sync? 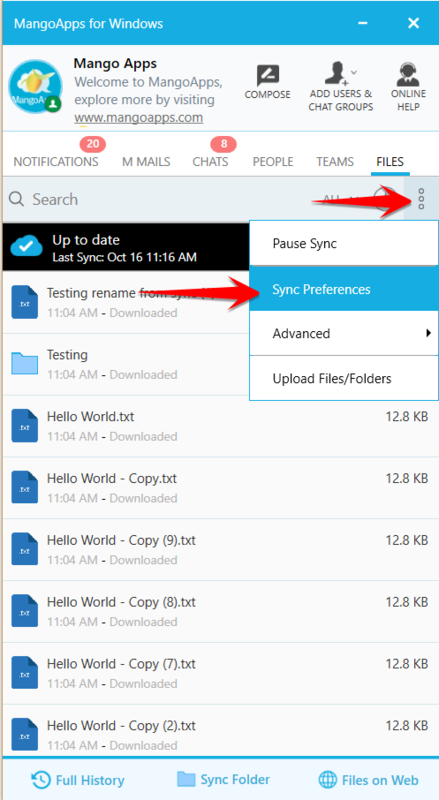 Click on Selective Folder Sync and navigate and un-check the folders you do not wish to sync any longer or check the folders you wish to sync and click on “Done” to save settings. 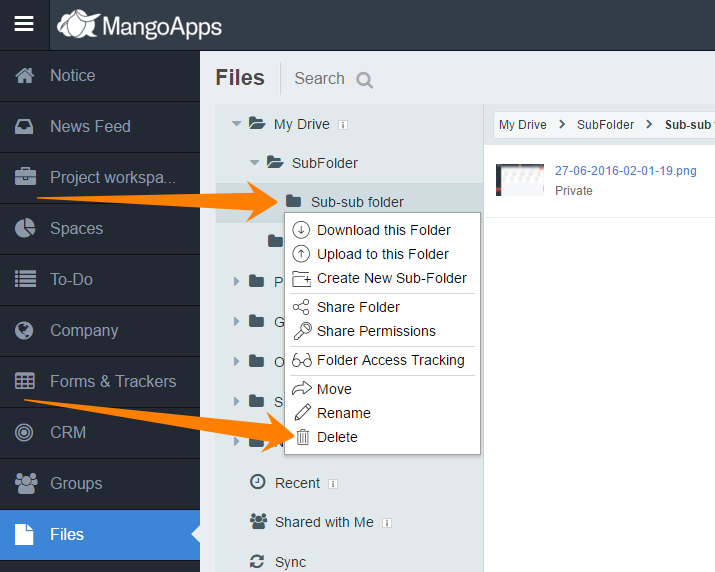 Please note: Folder/folders that you have unsynced will no longer be synchronized in the MangoAppsSync folder and will be left as is on your local disk. If you don’t want them to remain on your local disk, you can delete them manually. To resume sync, either click on the Pause toggle button or click on the three dots to view the “Resume Sync” action. Sync summary provides an in-depth account of the recent sync activity. It will show files that have not been synced because they are on the ignored files list, or because they cannot be synced since they contain special characters that cannot be stored on certain file systems. You can launch “Sync Summary” by clicking on Files tab on MangoApps for Windows. A user can sync a maximum of 2 computers. After you unlink a computer, your content will still be on your computer. Files attached from external document repositories such as SharePoint, Office 365, Google Drive, Box, Dropbox, SkyDrive, Windows File Server, etc are not included in the sync, because they do not reside on MangoApps. Note: In addition to this “.”, “$”, “~” not allowed at the front or back of folder/file name. Not all characters are allowed in the file system of all operating systems. Alternatively, you can Zip or RAR these files. The Download Bandwidth can be either unlimited (default) or limited to a custom value. This is the bandwidth available for data flowing from the MangoApps Server to MangoApps for Windows. 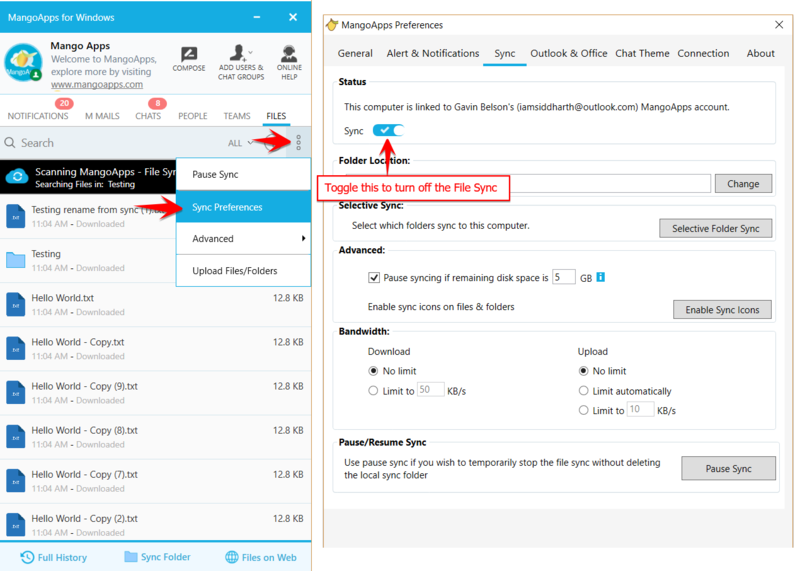 The Upload Bandwidth, the bandwidth available or data flowing from the MangoApps for Windows to the MangoApps server, has an additional option to limit automatically. When this option is checked, the MangoApps client will surrender available bandwidth to other applications. Use this option if there are issues with real time communication in conjunction with the MangoApps for Windows.